My motivation for watching Darling was less in the expectation of experiencing an enthralling story (although I always live in hope) and much more based on being a Prabhas fan – which in hindsight was the right attitude to take. Although the underlying themes of friendship and father-son relationships are reasonably well dealt with, the romance between the two leads follows a fairly dull and predictable path despite the attempt at a twist at the interval. However Prabhas and Kajal are both entertaining to watch in spite of the inevitability of the storyline and for a romantic comedy, what it lacks in passion it more than makes up for in the humour. Especially since for a change, the comedy is part and parcel of the story rather than a separate unfunny and irrelevant track. Best of all, there is not even a sniff of Ali or Brahmi anywhere in the proceedings. There is plenty of Prabhas instead and really, that’s enough right there to make this a film worth watching! Prabhas is Prabha (why not just stick with Prabhas I wonder? ), who is the devoted son of a loving father Hanumanthu (Prabhu). The film opens with the last day of Hanumanthu’s time at college and the pledge of all the friends to meet up every 5 or 10 years to renew their friendship. This opening section is all shot in black and white and the lack of colour ensures this section features some of the most conservative and tasteful outfits the men wear for the entire film, despite the fact that it’s set in the eighties. These reunions give the various families a chance to get to know each other too, and a young Prabha is smitten by Vishwanath’s daughter, Nandini. However before love gets a chance to bloom, Nandini and her family move to Switzerland while Prabha grows up to celebrate his own last day at college with a similarly dedicated group of friends. Although rather than vowing to meet up every few years, Prabha’s friends seem to be permanently welded to his side since they all come along for Hanumanthu’s latest big college reunion. 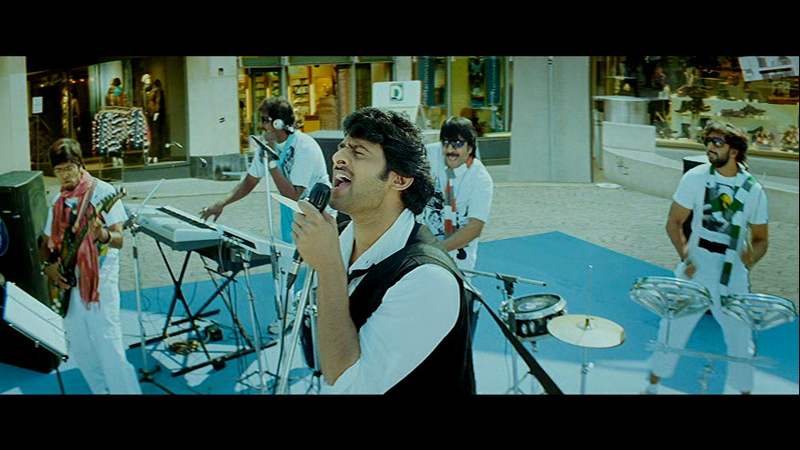 They all also play in a band together and seem to share Prabha’s (lack of) fashion sense (the manband! ), although perhaps there is a rule that states if you are performing in a band scarves are obligatory. The first half involves a side trip to Switzerland where amazingly everyone seems to speak Telugu, although given Dharmavarapu Subramanyam’s pronouncements that may not be quite so surprising. Prabha is hopeful that a meeting with Nandini will be enough to restart their love story, but there is a minor complication in the form of Nisha (Shradha Das in a very brief cameo) who is in love with Prabha. Her father (Mukesh Rishi) is a local don and he is determined to ensure that his daughter gets whatever she wants even if that means forcing Prabha at gunpoint to marry his daughter. Despite his threatening persona, Mukesh Rishi mainly plays his character for laughs and it’s fun to see him in this type of role blending mayhem with merriment and revealing a surprisingly sensitive soul. While the main feature of the film is the romance between Prabha and Nandini, the relationships between the various older men are actually more interesting and appear more genuine. Sure they’re cheesy, over-simplified and even a little too dramatic at times, but these moments give the film some much needed warmth. Stalwarts including Aahuthi Prasad, Chandra Mohan, Dharmavarapu Subrahmanyam and M. S. Narayana all work together naturally, so that they really do all seem to be old friends catching up over a few glasses of whiskey and a cricket match. The relationship between Prabha and his father is also nicely portrayed and both Prabhas and Prabhu bring a realistic camaraderie to their interactions. In fact throughout Prabhas is effortlessly charming despite the succession of ridiculously baggy and shapeless t-shirts he wears. Nothing seems to fit and he’s much too tall to look anything but scruffy in wide-necked and voluminous shirts – plus the dual layered hats, inexplicable scarves and worn-off-one-shoulder bespangled jacket. Prabhas seems to have been lumbered with a stylist that hates him, and in a complete reversal of normal, Kajal is the one who gets to wear much more reasonable outfits. There are a few misses, after all this is Tollywood where apparently giving someone fairy wings means they are wearing a ‘holy dress’, but overall Kajal looks fantastic. She also puts in a convincing performance although it would perhaps have made the story a little more interesting if there had been a difference in character between the dream Nadini of the first half, and the real Nandini in the second half. Kajal throws herself into the dancing, and apart from one bizarre attempt at what I think was supposed to be Bharatanatyam (what were they thinking!!) the choreographer has stuck to her strengths and put her enthusiasm to good use. There is plenty of hip shaking and arm waving but less actual dancing, so she looks more co-ordinated than usual. The choreography is a little less successful for Prabhas, but then again I may just have been distracted by those hideous outfits. This is a beautifully shot song that features the scenery of Switzerland morphing into Hyderabad and also some beautiful CGI scenes of snow, along with some of the better outfits worn by Prabhas. Added in to the mix is an attempted suicide by Nisha which infuriated me (completely unnecessary), a side story involving Hanumanthu’s adopted father and brother and a rival for Nandini’s affections in the form of Appala Naidu’s son Rishi (Santosh). There are a limited number of fight scenes but with Peter Hein choreographing, they all look good and generally fit into the flow of the film. The music by G. V. Prakash is unremarkable but Andrew’s cinematography makes the most of the settings in Switzerland – if only the costumes had matched. Overall Darling is a film that’s not too taxing to watch and is certainly less gory and more family friendly than the recent Rebel. Director A. Karunakaran ensures good performances from all but a sharper story would have made for a better film. 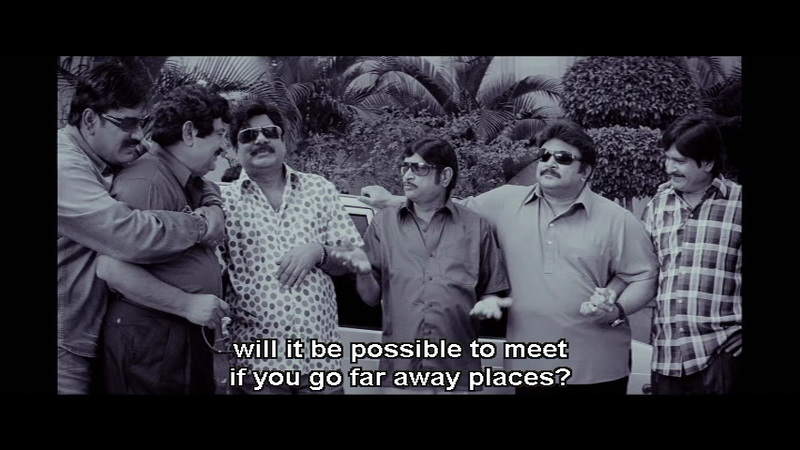 Worth it for Prabhas, Kajal and the gang of older actors who looked to be having a great time. 3 stars. This entry was posted in Tollywood and tagged A. Karunakaran, Aahuthi Prasad, Chandra Mohan, Darling, Dharmavarapu Subrahmanyam, G.V. Prakash, Kajal, Kajal Agarwal, Kota Srinivasa Rao, M.S. Narayana, Mukesh Rishi, Peter Hein, Prabhas, Prabhu, Shradha Das, Telugu, Tollywood, Tulasi. Bookmark the permalink. Before the comment, I’d like to start by saying that you guys do a wonderful job… I thoroughly enjoy your work… keep it up. I felt that this movie, albeit having a good premise, suffered from complacency in directing and editing departments. With some more relevant scenes (and cutting out the opposite ones), it could have been much better is what I felt. As for A. Karunakaran, I dunno why he keeps messing up the ending of his movies…. I felt that despite some ordinary music, “Neeve Neeve” is a pleasantly catchy track. 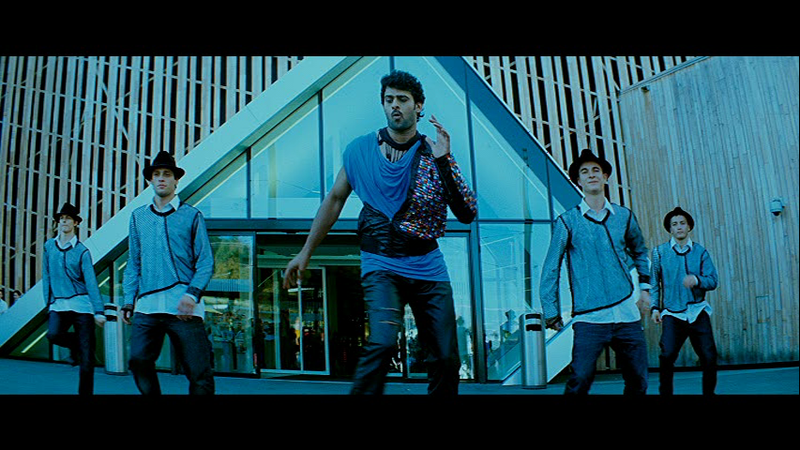 I believe Prabhas’ dressing is the result of his trying too hard to look hip (like those dude in Step-Up movies, u know). Totally agree with your comment about the editing. The first half could have been much shorter without losing any of the story, especially since the events of the second half were generally much more interesting. The end was just ridiculous, but I always enjoy some machete waving out of car windows so it did have plus points too! Not too sure how hip the Step-Up dudes were, but at least their clothes fitted them better! I did read an interview where Prabhas talked about his styling appealing to the ‘youth’. 😛 That’s obviously not me! And after a long time Heather, you have reviewed a Telugu film. Hi Sasank – very true.